In 2008 Toby turned his restaurant dream into a reality and opened a honky-tonk bar named after his hit single, “I Love This Bar”. Toby’s very first “I Love This Bar & Grill” restaurant opened in Mesa Riverview, AZ, and soon after, opened fourteen additional locations across the country. The country-themed bar, with its fantastic music venue and good ol’ southern food, was everything we could have imagined from Toby. The restaurant’s own website, calls the bar “the best honky-tonk in town” and we’re sure you Toby fans would agree! But the business recently took a turn for the worst, and since the opening of the restaurants, nine have already closed their doors, including one in Phoenix, AZ. There are only five franchises remaining of the fourteen original Toby’s I Love This Bar & Grill. 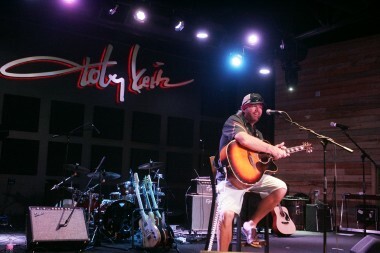 The sole Phoenix location of Toby Keith’s I Love This Bar & Grill, a chain of country music-themed hybrid bar/restaurant/performance venues that are endorsed by the chart-topping superstar and carried his name, unceremoniously closed its doors on Tuesday. The spot’s Facebook page has been deleted and its phone is no longer in operation. Toby Keith’s I Love This Bar & Grill at Victoria Gardens in Rancho Cucamonga has become the latest restaurant in the chain to close. The phone number at the restaurant is disconnected, and a link to the location has been removed from the chain’s website. The country music superstar himself performed at the opening ceremony and both up-and-coming and known country stars played the venue over the years, including Phil Vassar and Rodney Atkins in August. Our hearts are hurting for you, Toby Keith! Check out the video below to hear the song that inspired Toby’s dream come true, “I Love This Bar”.